LED lighting manufacturers traditionally employed a luxmeter as the production line test equipment in the past, but the biggest issue is the huge measurement error between the luxmeter and an integrating sphere measurement. The design concept of Chroma LED high speed measurement module is to combine several large size detectors to add up the luminous flux obtained by each detector to calculate the total flux of LED light. This design not only overcomes the shortcomings of the previous measurements, for total flux, by using a conventional integrating sphere, it also implements the inline tests on the production line. Chroma is able to provide the customer with a fully automatic production line that covers both quality and productivity. Chroma uses the unique LED lamp optical measurement technology to develop the automated test system (Model No. 58158-SC) which suits all kinds of LED luminaries. In addition to saving substantial space, the test speed could be up to 10,000 pcs per day while the measurement performance could also reach integrated sphere level. Through this unique LED lamps 100% test technology, the product yield distribution could be identified clearly, the material cost could be reduced in a timely manner, the product competitiveness could be enhanced, and the personnel and material waste could be lower. Chroma, with its automation professional competence, introduced the industry’s first LED bulb auto assembly line in 2012, which increases capacity effectively and reduces assembly costs significantly. 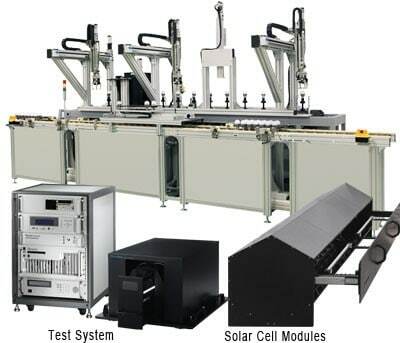 It combines in line automated test program to achieve 100% test after assembling and ensure the better shipping quality of LED lamps.